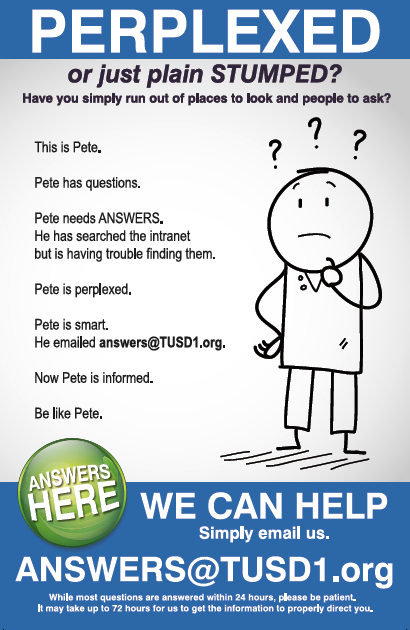 Email answers@TUSD1.org to get the answers you need! If you have questions about Tucson Unified, including how to enroll your child, what school options are available to you or free summer meals, and you don't know where to turn, email answers@tusd1.org. We'll direct you to the people, places, or information that you need! While most questions will be answered within 24 hours, please be patient. It may take up to 72 hours for us to get the information to properly direct you. We'll also provide answers to employees so they can stay informed, work smart, and learn what they need to get the job done!